White paper on crime 2001 Part 2/Chap.6/Sec.3/2. Reparation of damage to crime victims and their families is by nature a civil liability to be assumed by the perpetrators. However, the active involvement of the government may be required for the relief of crime victims because many perpetrators do not have sufficient financial resources. The government operates relief systems for victims that are prescribed in the Law Concerning State Compensation for the Victims of Crime, etc. (Law No.36 of 1980). There are other substantive relief measures for crime victims under the provisions in the Law Concerning Compensation for Damage to Witness, etc. In response to the indiscriminate bombing attacks by extremist groups in 1974; implementation of the crime victim benefit systems was commenced in January 1981 under the Law Concerning State Compensation for the Victims of Crime, etc. that was promulgated on May 1, 1980. This came against the social background of increased public demand for governmental relief systems for victims, because little relief was provided for the victims of such bombing attacks and random killings. Later, when indiscriminate injuries and killings such as the Sarin gas attack on Tokyo subway trains in 1995 occurred, the public became aware that victims of such offenses were in a terrible situation and there was a growing demand for support for such victims including improvement of the crime victim benefit systems. In light of this, measures were taken to improve relief systems with the intention of expanding the scope of eligible persons for benefits and increasing the amount of benefits, and the law was revised accordingly in July 1, 2001 (The Japanese name for the law was changed while the English name remained the same). Under the crime victim benefit systems, the government pays crime victim benefits (hereinafter referred to as"benefits")to bereaved families of those who are killed, those who are seriously injured or disabled by offenses committed with the intention of killing or injuring. These systems have been established to support victims and their families who cannot receive any effective relief because the perpetrators do not have sufficient financial resources. Table II-32 shows the implementation of the Law in the 20 years from January 1, 1981, when it took effect, to December 31, 2000. The benefits are paid in a lump sum, and are divided into three types:"survivor's benefits"paid to bereaved families;"disability benefits"paid to disabled victims;and"serious injury/sickness benefits"paid to victims who suffered serious injury or sickness. 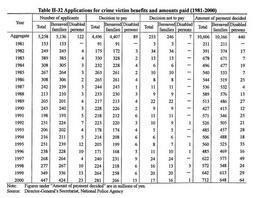 The amount of survivor's benefits and of disability benefits is calculated based on the age, salary, etc. of the victim, and the maximum amount per victim is 15.73 million yen for survivor's benefits and 18.492 million yen for disability benefits. Serious injury/sickness benefits are paid to victims who suffered an injury or sickness that required hospitalization for at least 14 days and medical treatment for at least 1 month, and the benefits are to be paid for a period up to 3 months. The amount shall be equivalent to the amount of medical expenses incurred by the victim under medical insurance. In response to the rapid increase of automobile accidents, the Automobile Liability Insurance Law was enacted in July 1955 in order to establish an automobile liability insurance system and ensure thorough protection of victims in such accidents. The Law came into force between August 1955 and February 1956. The Law is designed to protect victims, who are killed or injured by automobiles in road traffic, by establishing a system that guarantees compensation for damage. The automobile liability insurance system under the Law may be deemed to be one of the relief systems for victims. Automobile third-party liability insurance ("third-party insurance")and automobile mutual liability insurance ("mutual insurance")constitutes the core of the automobile liability insurance system. In order to complement the third-party insurance and the mutual insurance, the government operates an automobile liability compensation system. Under this system, the government provides compensation for damage to victims of hit-and-run cases or accidents caused by uninsured automobiles, because such victims are not covered by third-party insurance or mutual insurance. The amount of compensation is similar to that of the benefits under the third-party insurance. In fiscal 1999, the system covered 3,149 hit-and-run cases and 488 uninsured cases, paying about 1,846 million yen to 93 persons killed, about 1,911 million yen to 3,544 persons injured. Thus, the system paid about 19.85 million yen per person killed and 540,000 yen per person injured (Source:Road Transport Bureau, Ministry of Land, Infrastructure and Transport). The Law Concerning Compensation for Damage to Witnesses, etc. provides that, where witnesses in criminal cases or their relatives are killed or injured by others in connection with their statement before courts, judges or investigating authorities or their appearance in court to make such statement, or where official defense counsels or their relatives suffer similar damage as they perform or try to perform their duties, the government shall pay benefits concerning medical treatment, injury/sickness, disability, the bereaved, funerals and so forth. A partial amendment to the Law, effective since April 1, 1996, provides for a new system of nursing care benefits for victims who receive necessary care as a result of injury that is to be covered by injury/sickness benefits or disability benefits. Those who wish to receive any of the the benefits prescribed under the Law file an application to the Minister of Justice, who decides on the payment. To date, benefits have been paid in 5 cases under this Law (Criminal Affairs Bureau, Ministry of Justice).